But some of those trails are in the very high country, and those will have to wait until later in the season. We've got a list of those--far too many for this coming summer. And we also have a list of trails that might work earlier in the season, particularly if this low snow year holds into the summer. We are supposed to get some snow this week, and if we get a few more storms, it might even help us catch up to normal. 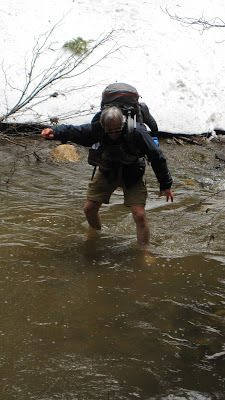 That's Jon at right, making the best of a bad creek crossing on a early season hike two years ago, in a normal year. Icy. And it wasn't all that much fun slipping our boots on and off while sitting in the snow, either. At any rate, unless it really starts snowing in the next month or so, we'll be on the trail this year earlier, and higher, than any year we can remember. Speaking of remembering, we also remember what it's like to be the first person out on the trail each year. We run into downed trees, impassable creeks, and all sorts of adventures. That's avalanche damage above, and it was such a mess that we just decided to camp where we were, instead of forcing our way through the fallen trees. Lovely place, with some nice fishing, too. And then the trails are either hard to find because they are under snow, or muddy, or full of water, like the one at left, on the way down from Cinko Lake in the Hoover Wilderness.